Usually when I lay on an afternoon tea I put quite a lot of preparation into it. This week I have been away to Bluestone, Pembrokeshire - a free holiday thanks to a competition on the Bluestone Facebook page! One of the days was spent milling around a lovely village called Narberth, there picked up some scones and a cake or too before heading back to Bluestone. With limited food in the lodge as we ate out mostly, when we returned the idea of a sandwich escalated into an impromptu afternoon tea. We had really limited food supplies, so had to work with what we had - you will understand when you see the menu! This was such a wonderful one off afternoon tea, doing something on impulse is such a good thing. The teapot and set in the lodge really did make this afternoon tea, very impressed with Bluestone there was a milk jug and even a tea strainer. 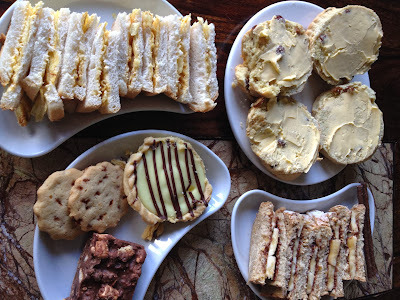 I will remember my first visit to Pembrokeshire for a number of reasons, this special afternoon tea being just one of them. I will leave you with this thought, we should eat crisp sandwiches more often. I love afternoon tea and this one looks great.